This article is about the "American" blueberry. For the "European" blueberry, see Bilberry. For other uses, see Blueberry (disambiguation). Blueberries are perennial flowering plants with blue– or purple–colored berries. They are classified in the section Cyanococcus within the genus Vaccinium. Vaccinium also includes cranberries, bilberries, and huckleberries. Commercial "blueberries" – including both wild ('lowbush') and cultivated ('highbush') blueberries – are all native to North America. The highbush blueberry varieties were introduced into Europe during the 1930s. Blueberries are usually prostrate shrubs that can vary in size from 10 centimeters (3.9 in) to 4 meters (13 ft) in height. In commercial production of blueberries, the species with small, pea–size berries growing on low–level bushes are known as "lowbush blueberries" (synonymous with "wild"), while the species with larger berries growing on taller cultivated bushes are known as "highbush blueberries". The leaves can be either deciduous or evergreen, ovate to lanceolate, and 1–8 cm (0.39–3.15 in) long and 0.5–3.5 cm (0.20–1.38 in) broad. The flowers are bell-shaped, white, pale pink or red, sometimes tinged greenish. The fruit is a berry 5–16 millimeters (0.20–0.63 in) in diameter with a flared crown at the end; they are pale greenish at first, then reddish-purple, and finally dark purple when ripe. They are covered in a protective coating of powdery epicuticular wax, colloquially known as the "bloom". They have a sweet taste when mature, with variable acidity. Blueberry bushes typically bear fruit in the middle of the growing season: fruiting times are affected by local conditions such as altitude and latitude, so the peak of the crop, in the northern hemisphere, can vary from May to August. Many commercially sold species with English common names including "blueberry" are from North America. Many North American native species of blueberries are grown commercially in the Southern Hemisphere in Australia, New Zealand and South American nations. Several other wild shrubs of the genus Vaccinium also produce commonly eaten blue berries, such as the predominantly European Vaccinium myrtillus and other bilberries, which in many languages have a name that translates to "blueberry" in English. See the Identification section for more information. Note: habitat and range summaries are from the Flora of New Brunswick, published in 1986 by Harold R. Hinds, and Plants of the Pacific Northwest coast, published in 1994 by Pojar and MacKinnon. Structure of anthocyanins, the blue pigments in blueberries. Numerous highbush cultivars of blueberries are available, with diversity among them, each having individual qualities. A blueberry breeding program has been established by the USDA-ARS breeding program at Beltsville, Maryland, and Chatsworth, New Jersey. This program began when Frederick Vernon Coville of the USDA-ARS collaborated with Elizabeth Coleman White of New Jersey. In the early part of the 20th century, White offered pineland residents cash for wild blueberry plants with unusually large fruit. After 1910 Coville began to work on blueberry, and was the first to discover the importance of soil acidity (blueberries need highly acidic soil), that blueberries do not self-pollinate, and the effects of cold on blueberries and other plants. In 1911, he began a program of research in conjunction with White, daughter of the owner of the extensive cranberry bogs at Whitesbog in the New Jersey Pine Barrens. His work doubled the size of some strains' fruit, and by 1916, he had succeeded in cultivating blueberries, making them a valuable crop in the Northeastern United States. For this work he received the George Roberts White Medal of Honor from the Massachusetts Horticultural Society. The rabbiteye blueberry (Vaccinium virgatum syn. V. ashei) is a southern type of blueberry produced from the Carolinas to the Gulf Coast states. Other important species in North America include V. pallidum, the hillside or dryland blueberry. It is native to the eastern U.S., and common in the Appalachians and the Piedmont of the Southeast. Sparkleberry, V. arboreum, is a common wild species on sandy soils in the Southeast. Successful blueberry cultivation requires attention to soil pH (acidity) measurements in the acidic range. Blueberry bushes often require supplemental fertilization, but over-fertilzation with nitrogen can damage plant health shown by nitrogen-burn visible on the leaves. In 2017, world production of blueberries (low- and highbush combined) was 596,813 tonnes, led by the United States with 40% of total production and Canada with 27%. In 2016, Canada was the largest producer of wild blueberries, mainly in Quebec and the Atlantic provinces, but the production effort for wild blueberries was changing in 2017 to the more profitable cultivated highbush blueberries. Significant production of highbush blueberries occurs in British Columbia, Maryland, Western Oregon, Michigan, New Jersey, North Carolina, and Washington. The production of southern highbush varieties in California is rapidly increasing, as varieties originating from University of Florida, Connecticut, New Hampshire, North Carolina State University and Maine have been introduced. Southern highbush berries are now also cultivated in the Mediterranean regions of Europe, Southern Hemisphere countries and China. According to a 2014 report by US Department of Agriculture, Washington was the nation's largest producer of cultivated (highbush) blueberries with 96.1 million pounds, followed in order of "utilized production" volume by Michigan and Georgia, Oregon, New Jersey, California and North Carolina. In terms of acres harvested for cultivated blueberries in 2014, the leading state was Michigan (19,000 acres) followed by Georgia, Oregon, Washington and New Jersey. Hammonton, New Jersey claims to be the "Blueberry Capital of the World", with over 80% of New Jersey's cultivated blueberries coming from this town. Every year the town hosts a large festival that draws thousands of people to celebrate the fruit. Resulting from cultivation of both lowbush (wild) and highbush blueberries, Maine accounts for 10% of all blueberries grown in North America with 44,000 hectares (110,000 acres) farmed, but only half of this acreage is harvested each year due to variations in pruning practices. The wild blueberry is the official fruit of Maine. Canadian production of wild and cultivated blueberries in 2015 was 166,000 tonnes valued at $262 million, the largest fruit crop produced nationally accounting for 29% of all fruit value. British Columbia was the largest Canadian producer of cultivated blueberries, yielding 70,000 tonnes in 2015, the world's largest production of blueberries by region. Atlantic Canada contributes approximately half of the total North American wild/lowbush annual production with New Brunswick having the largest in 2015, an amount expanding in 2016. Nova Scotia, Prince Edward Island and Québec are also major producers. Nova Scotia recognizes the wild blueberry as its official provincial berry, with the town of Oxford, Nova Scotia known as the Wild Blueberry Capital of Canada. Québec is a major producer of wild blueberries, especially in the regions of Saguenay-Lac-Saint-Jean (where a popular name for inhabitants of the regions is bleuets, or "blueberries") and Côte-Nord, which together provide 40% of Québec's total provincial production. This wild blueberry commerce benefits from vertical integration of growing, processing, frozen storage, marketing and transportation within relatively small regions of the province. On average, 80% of Québec wild blueberries are harvested on farms (21 million kg), the remaining 20% being harvested from public forests (5 million kg). Some 95% of the wild blueberry crop in Québec is frozen for export out of the province. Highbush blueberries were first introduced to Germany, Sweden and the Netherlands in the 1930s, and have since been spread to Lithuania, Latvia, Estonia, Romania, Poland, Italy, Hungary and other countries of Europe. Poland, Germany, and France were the largest European producers in 2014 (table). In the Southern Hemisphere, Peru, Chile, Argentina, Uruguay, South Africa, New Zealand, and Australia grow blueberries commercially. Blueberries were first introduced to Australia in the 1950s, but the effort was unsuccessful. In the early 1970s, the Victorian Department of Agriculture imported seed from the U.S. and a selection trial was started. This work was continued into the mid-1970s when the Australian Blueberry Growers' Association was formed. In the 21st century, the industry grew in Argentina: "Argentine blueberry production has increased over the last three years with planted area up to 400 percent", according to a 2005 report by the U.S. Department of Agriculture. "Argentine blueberry production has thrived in four different regions: the province of Entre Rios in northeastern Argentina, the province of Tucuman, the province of Buenos Aires and the southern Patagonian valleys", according to the report. In the Bureau of International Labor Affairs report of 2014 on child labor and forced labor, blueberries were listed among the goods produced in such working conditions in Argentina. Production in Chile ranges from Copiapó in the north to Puerto Montt in the south, allowing the country to offer blueberries from October through late March. Production evolved rapidly since 2010, becoming the fourth most important fruit exported in value terms. Blueberries are exported mainly to North America (79%), followed by Europe (17%), and Asia (South Korea, China and Japan). Although blueberries were traditionally hand-picked with berry-picking rakes, modern farmers use machine harvesters that shake the fruit off the bush of cultivated highbush blueberries, while new machines are being developed for wild, lowbush blueberries. The fruit is then brought to a cleaning and packaging facility where it is cleaned, packaged, and then sold. Tunnels are often used to grow blueberries in Europe and this makes the season longer, which in turn creates an opportunity to move crops into earlier or later markets to get better prices. Because "wild" is a marketing term generally used for all low-bush blueberries, it is not an indication that such blueberries are free from pesticides. ^ "Blueberry Information". Jerseyfruit.com. Retrieved 2013-11-06. 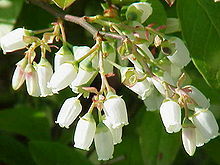 ^ "Plants Profile: Vaccinium corymbosum L., Highbush blueberry". US Department of Agriculture, National Resources Conservation Service. 2013. Retrieved 30 April 2013. ^ a b "In-depth nutrition information on raw blueberries, per 100 g, USDA Nutrient Database, Standard Reference version SR-21". Nutritiondata.com. Conde Nast. 2014. Retrieved 28 November 2014. ^ Kalt W, Ryan DA, Duy JC, Prior RL, Ehlenfeldt MK, Vander Kloet SP (October 2001). "Interspecific variation in anthocyanins, phenolics, and antioxidant capacity among genotypes of highbush and lowbush blueberries (Vaccinium section cyanococcus spp.)". J Agric Food Chem. 49 (10): 4761–7. doi:10.1021/jf010653e. ISSN 0021-8561. PMID 11600018. ^ "Flavonoids". Micronutrient Information Center, Linus Pauling Institute, Oregon State University, Corvallis, OR. November 2015. Retrieved 25 December 2017. ^ "Growing Highbush Blueberries" (PDF). University of New Hampshire-Extension. Retrieved September 22, 2013. ^ "Wild Blueberry Network Information Centre". Wild Blueberry Network Information Centre. ^ "Blueberry Growing Comes to the National Agricultural Library". US Department of Agriculture, Agricultural Research Magazine, Vol. 59, No. 5. June 2011. Retrieved 17 June 2011. ^ "The History of ''Whitesbog Village''". Whitesbog.org. 2014. Archived from the original on 2008-05-15. Retrieved 2011-10-11. ^ "History of White's Bog". Whitesbog Preservation Trust. Archived from the original on 2008-05-15. Retrieved 2008-01-11. ^ Jim Minick (June 29, 2016). "The Delicious Origins of The Domesticated Blueberry". JSTOR News. Retrieved June 30, 2016. ^ a b Longstroth M (2014). "Lowering the soil pH with sulfur" (PDF). Michigan State University. ^ a b c Hayden RA (2001). "Fertilizing blueberries" (PDF). Purdue University, Department of Horticulture. Retrieved 5 September 2015. ^ "Cornell fruit: berry diagnostic tool". Cornell University, Department of Horticulture. 2013. Retrieved 5 September 2015. ^ a b "Blueberry production in 2017; Crops/Regions/World list/Production Quantity (pick lists)". UN Food and Agriculture Organization, Corporate Statistical Database (FAOSTAT). 2018. Retrieved 18 March 2019. ^ "Canadian Blueberries". Agriculture and Agri-Food Canada, Government of Canada. 24 November 2016. Retrieved 25 December 2017. ^ "Blueberries: transitioning from wild to cultivated production". Charlottetown Research and Development Centre, Agriculture and Agri-Food Canada, Government of Canada. 31 January 2018. Retrieved 18 March 2019. ^ a b Bruce Eklund (January 2016). "2014 Blueberry Statistics" (PDF). United States Department of Agriculture, National Agricultural Statistics Service, New Jersey Field Office, Trenton, NJ. Retrieved 20 April 2016. ^ "Home: Welcome to the Town of Hammonton". Town of Hammonton. 2013-09-11. Retrieved 2013-11-06. ^ "The Beautiful Blueberry!". Pineypower.com. 2018. Retrieved 10 July 2018. ^ "Hammonton Chamber of Commerce". Hammontonnj.us. 2018. Retrieved 10 July 2018. ^ David E. Yarborough (February 2015). "Wild Blueberry Culture in Maine,". Cooperative Extension: Maine Wild Blueberries, University of Maine. Retrieved 20 April 2016. ^ "State Berry - Wild Blueberry". Secretary of State for Maine, Matthew Dunlap. 2007. Retrieved 8 July 2017. ^ a b "Fruit and vegetable production, 2015 - Canada". Statistics Canada. 3 February 2016. Retrieved 18 May 2016. ^ "British Columbia Blueberries". BC Blueberry Council. 2009. Retrieved 2013-11-06. ^ Deschênes V (20 April 2016). "New Brunswick to become world's largest producer of wild blueberries". Government of New Brunswick, Department of Agriculture, Aquaculture and Fisheries. Retrieved 18 May 2016. ^ Dorff E (30 November 2015). "Blueberry varieties - Canada. In: The changing face of the Canadian fruit and vegetable sector: 1941 to 2011". Statistics Canada. Retrieved 18 May 2016. ^ "Wild blueberry trivia". Wild Blueberry Producers Associations of Nova Scotia. 2016. Retrieved 18 May 2016. ^ a b c Gagnon A (2006). "Wild Blueberry Production Guide in a Context of Sustainable Development: Survey of the Wild Blueberry Industry in Québec" (PDF). Ministère de l’Agriculture, des Pêcheries et de l’Alimentation du Québec. Retrieved 4 February 2015. ^ a b "Australian Blueberry Growers' Association". Australianblueberries.com.au. Retrieved 2013-11-06. ^ Pirovano, Francisco (12 January 2005). "Argentina Blueberries Voluntary 2005". GAIN Report. Foreign Agricultural Service. Retrieved 22 June 2009. ^ "Progress Towards the Development of a Mechanical Harvester for Wild Blueberries". University of Maine, Cooperative Extension. 2001. Retrieved 28 November 2014. ^ "Catching the Toxic Drift: How Pesticides Used in the Blueberry Industry Threaten Our Communities, Our Water and the Environment". Environment Maine. 2005-08-16. Retrieved 2011-10-11. Sumner, Judith (2004). American Household Botany: A History of Useful Plants, 1620–1900. Timber Press. p. 125. ISBN 0-88192-652-3. Wright, Virginia (2011). The Wild Blueberry Book. Down East Books. ISBN 978-0-89272-939-5. 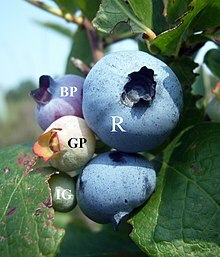 Wikimedia Commons has media related to Blueberries.